^ Haudricourt, André-Georges. 1961. “Bipartition Et Tripartition Des Systèmes de Tons Dans Quelques Langues d’Extrême-Orient.” Bulletin de La Société de Linguistique de Paris 56 (1): 163–80. English translation by Christopher Court: “Two-way and Three-way Splitting of Tonal Systems in Some Far Eastern Languages (Translated by Christopher Court).” In Tai Phonetics and Phonology, edited by Jimmy G. Harris and Richard B. Noss, 58–86. Bangkok: Central Institute of English Language, Mahidol University, 1972. 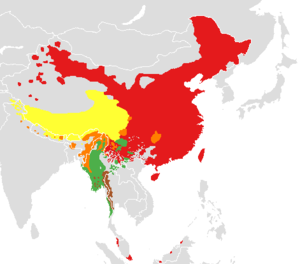 ^ （英文） 存档副本 Numbers in Sino-Tibetan Languages. [2010-07-01]. （原始内容存档于2011-05-14）.